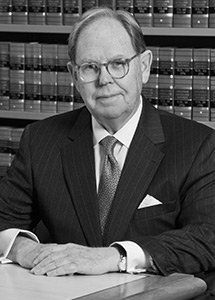 W. Jackson Williams, a founding partner of Williams & Anderson, is now senior counsel to the firm. As such, he continues to maintain an active practice. Mr. Williams received a Bachelor of Science degree from the University of Arkansas and a J.D. degree from Vanderbilt University. At Vanderbilt Mr. Williams was Associate Editor of the Vanderbilt Law Review. Mr. Williams was a member of the American Bar Association’s Task Force on Lawyers’ Political Contributions. He served as staff member of the Anthony Commission for Public Finance. Mr. Williams has extensive public finance experience in both general obligation and revenue bond issues, having been bond counsel to projects and programs involving public education, higher education, health care, industrial development, multi-family housing, water, sewer and electric utility financings. Mr. Williams has represented state agencies, Arkansas cities and counties, special purpose boards and commissions, hospitals, colleges and universities, local school districts and improvement districts. He has also served as underwriter’s counsel to numerous investment banking firms in their bond underwritings. In structured finance, Mr. Williams has extensive experience in representing issuers of single family housing bonds and student loan financings. Mr. Williams and the firm represented the State’s largest electric utility in the state’s first securitization of the restoration of storm costs (see Legislation). Arkansas College Savings Bond Act. He prepared Amendment 87 to the Arkansas Constitution which authorized the Arkansas State Lottery to support scholarships and grants for Arkansas citizens attending Arkansas institutions of higher learning and successfully defended the ballot title challenge before the Arkansas Supreme Court. Mr. Williams serves as general counsel to the firm’s principal banking client, a privately owned state-wide banking institution with fifty branches, principally located in Central and Northwest Arkansas. Mr. Williams is a founding member of both NABL and the American College of Bond Attorneys. He has served as a member of NABL’s Board of Directors and its Executive Committee, and has served as a member of the American College of Bond Attorneys’ Board of Directors. He remains active in both organizations.